~M. Moyles~ I just want to say thank you for the absolute dedication to quality. When you order almost anything from other companies there is a modicum of anxiety- will it be as good as described or photographed? Not w/Whitleys, always the best- makes ya smile! (oh and people in customer service.....helpful, happy & kind). ~Long Jr.~I have been using a vendor, KAD Hose, for 20 years. At first, I was given whiskey @ Christmas. I finally told them I don't drink and they said we have peanuts too. I started recieving your salted peanuts. They were the finest salted peanuts I have ever eaten. This year I didn't recieve my peanuts until late this month. When Ben arrived, he had 2 different boxes. He asked which I wanted, (big mistake, I love my peanuts, especially fresh roasted). I took both & today, my Granddaughter & I are having the great pleasure of eating your honey roasted peanuts. I have to tell you that these are the finest peanuts I've ever put in my mouth, including fresh roasted! Thank you so much for your quality peanuts. ~Hipockets~ My mother has sent me various varieties of your products every Christmas for the last 20 years. I really should have ordered from you myself, but your wonderful peanuts were such a memory of my great uncle frying his own peanuts, as I grew up in LEE HALL,VA. And they were such an anticipated Christmas treat from Ma! Ma left me this last august, and I had to have some Whitleys peanuts, so I placed a big order. For myself, and to share with friends. The order was a bit tight and time sensitive for Christmas, but you guys came through with flying colors!!! Your products are amazing! And your MAMMOTH PECANS will be neatly arranged across the top of my New Year’s Pecan pie. (they stand in line and fuss and bicker to get a bit of MY pecan pie!) Thanks to all ya’ll for prompt service and shipping…….thank you for prompt, courteous service! T. Caudill - I must admit the raving around here about your peanuts was, well, a bit much. "Like no other peanut you've ever tasted!" I didn’t get this big by being that picky, I have tried a lot of peanuts but it is true, your peanuts are the best I have ever tasted. Kevin - Thank you! I happened upon some of your nuts when I was back in VA for work...They're Awesome!! Now, I use them to bribe my staff. T. Carleton - Being at my cousins in November we stopped and I bought some peanut and a few other items. These peanuts are the best and I know this order my cousin sent. I was just ready to open the last bag having finished the tin. Will keep on buying these for sure!! Regina - Not only Great Peanuts, but terrific customer service! R. Martin - Ontario, Canada I just opened my first can of peanuts and was just blown away by the flavor and crispness of these nuts. I have purchased nuts from four other purveyors but these surpass them all. Now listen up folks "You've tried the rest Now buy the best". C. Powell - MD I don't usually care for spicy "hot" foods, but the Chipotle Honey Roasted Almonds are addictive!!! Upon first bite I didn't want anymore due to the "heat", but after taking my second bite, I could not stop eating them! They are uniquely de-licious!!! We live in MD but have bought many cans of these Almonds since they first came out. Never discontinue these please! B.Anderson - AL Just wanted to say that I received my shipment of candy & peanuts moments ago from UPS! NICELY packed. Christmas will be wonderful enjoying your products. Keep up the great work. 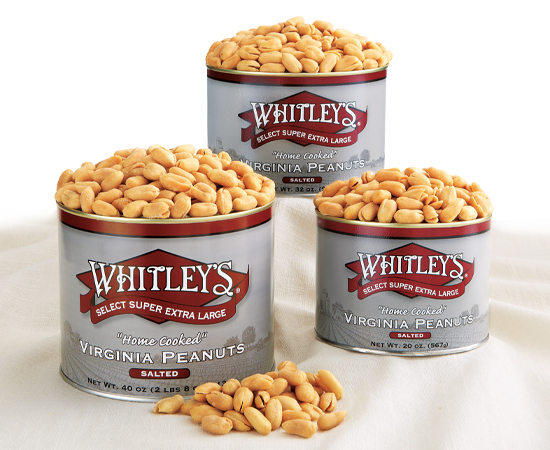 R. Hinman - Lawrence, KS I just experienced your wonderful Virginia Peanuts when they were brought to my work place and will be placing an order soon. C. Chapman - Indialantic, FL I appreciate your customer service. I wish all companies stood behind their products as Whitley Peanuts does. L. Stirling - Aberdeen, NJ Since the day a few, short years ago when I first bought your product in your Williamsburg store, I have continued to purchase your products as gifts for my family and friends. You have more than lived up to any expectations I may have had and cannot say enough about your staff members who I've had the pleasure to deal with. You all deliver and live up to your word. C. Best - Mechanicsburg, PA I usually do not like peanuts, but after tasting these that a coworker brought in, I am hooked. These were the tastiest peanuts I have ever had. Other coworkers agreed, they were delicious. W. Rucker - Jefferson, MD I have a good customer who sends me a tin of your peanuts each year. It's always a real treat, when that box shows up. In my 58 years, peanuts have always been my favorite any-time snack. I ordered two 32oz cans three weeks ago, and both tins are empty. So I will be ordering more soon as I can. K. Cooper - Jamaica, NY I received your salted roasted in shell peanuts for Christmas and they are absolutely the most delicious peanuts I have ever had! From the first bite, I knew that I would be going online to order more and I've done just that today. You now have another loyal customer and I have already spread the word. I can't wait until my next bag of nuts arrive! S. Johnson - Leonard, MN I give gifts of Whitley Peanuts to special people (Pharmacists, USPS Mail deliver, UPS deliver and they look forward to these tasty treats from Virginia. Comments are best ever, so crunchy, so fresh. P. Cunningham - Long Island, NY Hello to all, I would like to say Thank You. I had placed an order on 12/12/11 and asked for a delivery date of 12/19/11 and it was delivered yesterday 12/15/11. That is awesome. I have been in your store in Williamsburg many times and you sell a great product. Looking forward to eating those peanuts. L. Maltese - Indianland, SC We love your peanuts and they make wonderful gifts for our family. Mary D. As always, it is such a pleasure ordering from Whitley's. Not only do you have such wonderful peanuts (the best, in fact) and other selections but everyone at the company is so nice. S. Gordon - Amelia Island, FL Your quality seems very consistent to me, consistently delicious. G. Harris - Everyone likes your peanuts, I cannot miss with that gift! W. Strong You make shopping easy for a peanut lover! S. Brannon Always top quality, always shipped quickly. D. Palen Ease to purchase on line and Quick delivery. B. Neff Just to let you know, the mixed nuts are the absolute best I have ever had. Great Product and service. J. Maokre Already for the second time I got your salted "Home Cooked" Virginia Peanuts, and I like to express my perfect appreciation for the high quality of your product. S.Tearse - Duxbury, MA Great experience all the way through, the ease of ordering on your website, the updates about shipping, and the actual packaging. I will keep you on my list of Favorites for sure! P. Hodgson We've been a Whitley's customer for a number of years and continue to introduce people to your products. Dr. J. Boodley - Kent, OH I'm 83 years old and I've eaten a lot of peanut brittle in my time. But I have never eaten peanut brittle that's as delicious as yours!!! Cpt. C. Weishar - Newport, R.I. My first order of peanuts just arrived and I have eaten a small bowl of them. Can’t wait for tomorrow. They are truly a marvelous treat. Thank you. S. Tearse - Duxbury, MA Great experience all the way through, the ease of ordering on your website (love the shipping-included prices! ), the updates about shipping, and the actual packaging. I will keep you on my list of Favorites for sure! N. Brisco - Alexandria, VA Thanks for getting back to me so quickly and I greatly appreciate your help. Excellent Customer Service!!!!!!!! N. Sandberg - Coronado, CA Quote me if you wish, "Whitley's Peanut Factory comes through once again, when the order appeared lost and possibly not going to arrive by Christmas Day, Krystal Davidson worked here magic and across the USA from VA to Coronado, CA came those peanut clusters, peanut brittle, and roasted VA peanuts, and so ALL around the Christmas Tree on the 25th sat back and enjoyed---the BEST Peanuts in the USA!" Thank you Krystal and Thank you Whitley's Peanuts. M. Saunders As a family we reiterate our appreciation for the high standard of quality of your products and compliment Whitley Peanut Co. and its management for ensuring superior customer service and care. M. Davidson - North, VA You can tell your boss that the combat go to guys says, Whitleys Fusion Health Mix gets two thumbs up. HOOAH!!!!!!!! D. Wiggs - Bellingham, WA Whitley's Peanuts are the best. So good that we used to buy them as gifts for our customers and have them shipped across the country. So good that when we went to visit in upstate NY, my father in law would not let me in the door until I showed him the can of Whitley's I had brought with me.